You all have seen the cool shot the TOUR players hit – the low wedge shot that skips on the green and spins like crazy. Most players guess incorrectly that they need to hit down steeply and launch the ball high to achieve this – but that won’t work! 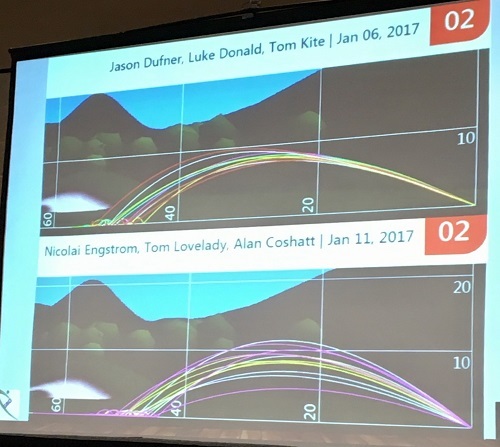 I just attended a very interesting seminar at the PGA Show that described the characteristics of the best wedge players on TOUR. The secret is two-fold and involves the movement of the club at impact and the equipment used. TOUR players have a low launch, high spinning shot into the green whereas amateurs have the opposite – and therefore they suffer poor distance control. Great wedge players have an uncanny ability to control launch angle, trajectory, and spin – and this helps them calibrate the energy needed to dial in the right distance. Imagine holding your thumb on a garden hose – you get the maximum carry of water if you hold the angle at 45 degrees. With wedge play, we know exactly what launch angle maximizes carry and we can measure this on our launch monitors. Notice on the top picture that Jason Dufner, Luke Donald, and Tom Kite all have identical launch angles on this 50 yard shot. The 3 players below that have a higher dispersion. How do we get low launch and high spin? We use video and the launch monitor in lessons to learn to lag the club and get 15 degrees of forward lean at impact so that we get a launch angle around 30 degrees for a 50 yard shot. We also learn to control the angle of attack so that it is only 4-5 degrees down. Then we calibrate the length of swing needed to carry it the correct yardage (which is usually a much smaller swing than you realize). TOUR players use high performance golf balls and they get new wedges every 30 days. And they always have a clean clubface and grooves when hitting. Friction is generated by the face hitting the ball – so if the face has worn down or the club is not clean, you can’t generate good spin. You also have to keep your ball in the short grass – it’s hard to generate spin out of the rough. When you improve your wedge play your scores will certainly come down. CLICK HERE to book a lesson if you want to assess your equipment or swing!